The Sakura Pillow is my latest free pattern. Sakura means cherry blossom in Japanese and this pillow was inspired by a traditional Japanese cherry blossom block – with a few variations. Spring has sprung here in Australia and the trees are blossoming, which was the main inspiration for this pattern. When I created my Sakura Pillow pattern, I trialled a new printer which I’d love for you to read about below. Here is the link to download and print up the FREE Sakura Pillow Pattern which includes a BONUS extra large flower template, perfect for a larger quilt project. When it comes to my sewing room, I like to have everything I need and use, at hand. There’s nothing worse than sitting down to work on a project and being interrupted because you don’t have your supplies or pattern. Certainly, the sewing machine, pressing surface, cutting mat and rotary cutter/s are a vital part of the quilters sewing room, but something else, which I think, is just as important, is a good printer. Right? I know that I love sitting with my iPad in the evening and seeing what my online friends are up to, looking for inspiration and new ideas. Google is our friend and Pinterest is such a wonderful space for being inspired (not to mention losing time). I so often see a beautiful pattern and think to myself, I’ll have to remember to go back to this when I go and log into my actual computer, so that I can print it. And then I invariably get side-tracked and forget where I’d seen the pattern. Sound familiar? This past week, I’ve been introduced to the new Epson EcoTank ET-2550 printer, one of five new printers in Epson’s new EcoTank range. I have had a lot of fun trialling it and putting it through it’s paces. I design a lot of patterns with hand drawn components - a printer (with scanner) is a very important part of this process for me personally. So, what makes this printer so special? Well, not only is it easy to use and compact, it comes with up to 2 years of ink included (based on the average home printing 150 pages per month). That’s 4,000 black and 6,500 colour pages. Epson have unleased the freedom to print without fear of running out of ink and having to go out and buy expensive cartridges. That’s what always bugged me about my old printer. It was always running out of ink (at the most inopportune times) and needed new cartridges, which are really expensive. The Epson EcoTank range have built-in high capacity tanks, which you simply top up with Epson ink bottles. I wondered if the replacement ink bottles would be pricey, but having a little look on their website, I discovered that they’re only $16.99 RRP each. The Expression ET-2550 (RRP: $479) comes with built in Wi-Fi Direct®, which means no router is required, allowing you to print from anywhere in your home and connect to multiple PC’s. The large EcoTanks are a fabulous feature, but another feature which I am really excited about is the fact that you can print directly from your tablet or smartphone! Imagine you’re on your iPad of an evening, and you come across a great pattern. 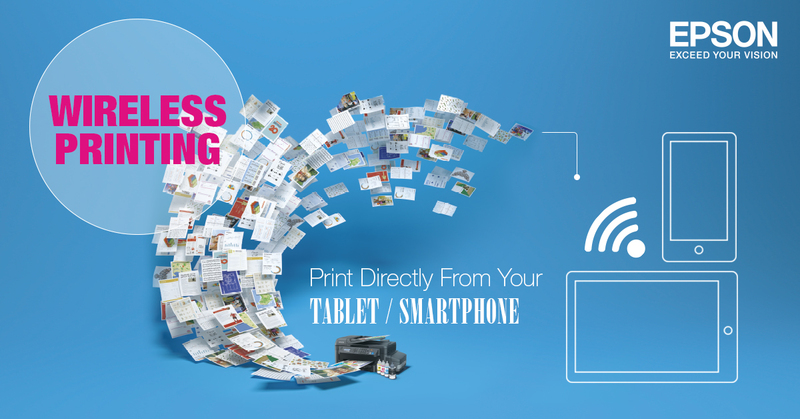 It’s super simple to print it, right there and then, directly from your tablet. While it may be a little more pricey to start with, the overall running of the machine and cost of replacement ink through the years, will make this a great investment for your home (or sewing room). Download my Free Sakura Pillow Pattern HERE including a Bonus Template for larger quilt projects. The templates were hand drawn and then easily scanned (and enlarged) using the Epson ET-2550. When on your iPad, did you know that you can open pattern or instructions using Safari? Select reader view and mail info to yourself...later open mail on your computer and print. And the best part of IOS 9 is that you can open in Safari, select PDF and put into iBooks. I hope I'm not preaching to the choir! Love yor blog! Thank you for the pattern and info on the printer! I love the fabrics you used.